Blog reader Peter kindly dropped me a note this afternoon having spotted something interesting in the London Evening Standard. It seems the traffic jams in our humble little neighbourhood have reached the attention of City Hall and Transport For London in Particular. According to the story in the Evening Standard a new 40-strong specialist team has been set up by Transport for London (TfL) to stop illegal and inconsiderate driving that leads to traffic delays in the capital. "will be deployed to key junctions and roads to help deal with problems that can cause delays to drivers and bus passengers, such as illegal stopping or unloading of deliveries. The new team will work closely with the TfL-funded Metropolitan Police Roads and Transport Policing Command, which was launched by the Mayor in January and, with 2,300 officers, is the largest policing command anywhere in the country." The Epsom & Ewell Silver Band is giving their annual Christmas concert this year at St Mary's Church on the Avenue (in the Epsom & Ewell quadrant) next Sunday (6th December) at 7pm. The Silver Band which (perhaps confusingly) is a brass band, has been around for 105 years and I suspect they should be pretty good by now! 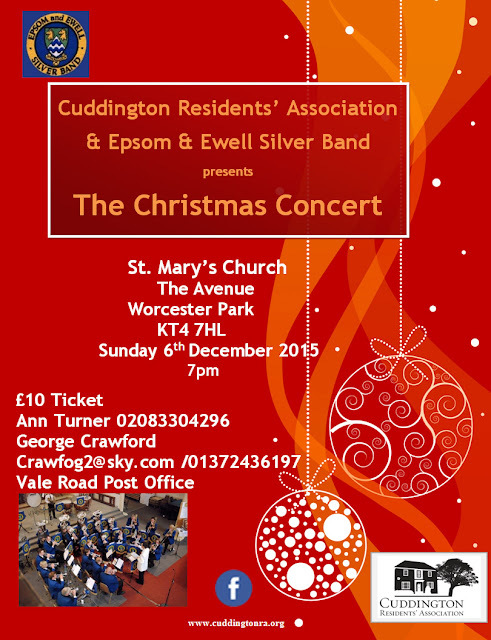 This particular concert, which is in it's third year, is organised by the local Cuddington Residents' Association and the local councillors (all from the residents' association). 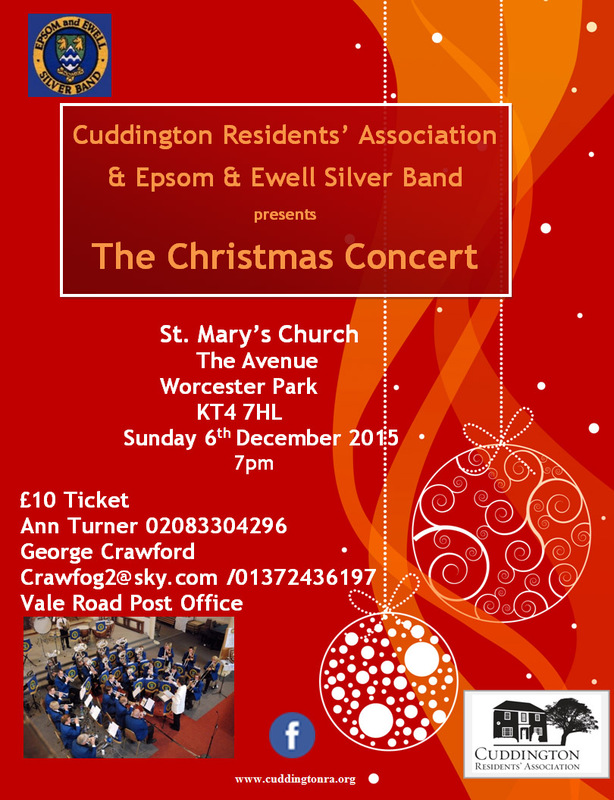 Money raised from ticket sales will go to help the church, support the band and also to help the local community. "Last year we raised about £1400 from this concert which is in its third year. We gave the church £300 ( which is way beyond the cost of hire) and we split the rest with the band. Fifty fifty. It is our policy to spend [this] money on local good causes and we will continue to do so." Cllr Crawford also mentioned that amongst other things, money raised would go to help improve the children's play area in Shadbolt Park. So if live music is to your taste (either brass or silver) go along and support them on Sunday and enjoy this year's special Christmas Concert at St Mary's. 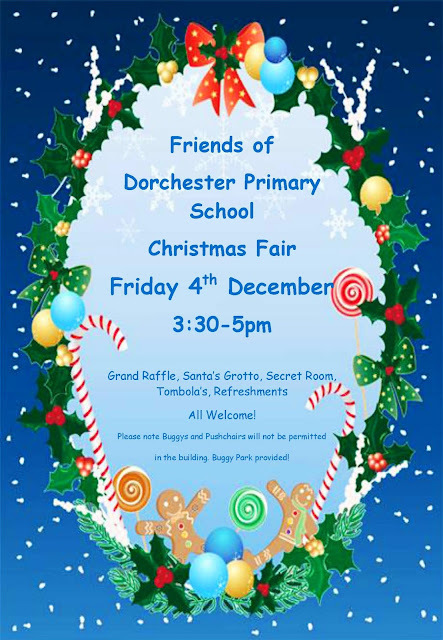 As the Christmas fairs continue, next Friday is Dorchester Primary School's turn. It all starts at 3:30pm just after the kids come out so it's ideal for parents picking their kids up and finishes at 5:00 giving everyone time to get home for dinner. 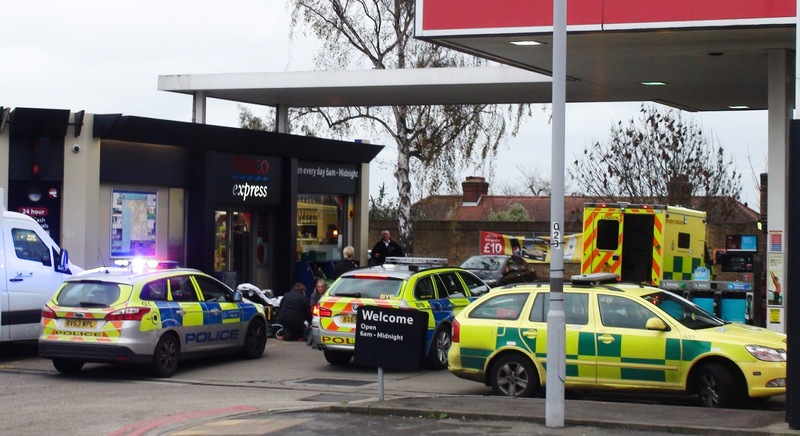 A person has been hit by a vehicle on the forecourt of the Esso/Tesco Garage in London Road North Cheam. Several police and ambulance staff were in attendance and rather busy so I didn't press them for details. However people may want to avoid the site for a short while. Thoughts are with the person hit and the blog hopes they make a full recovery. 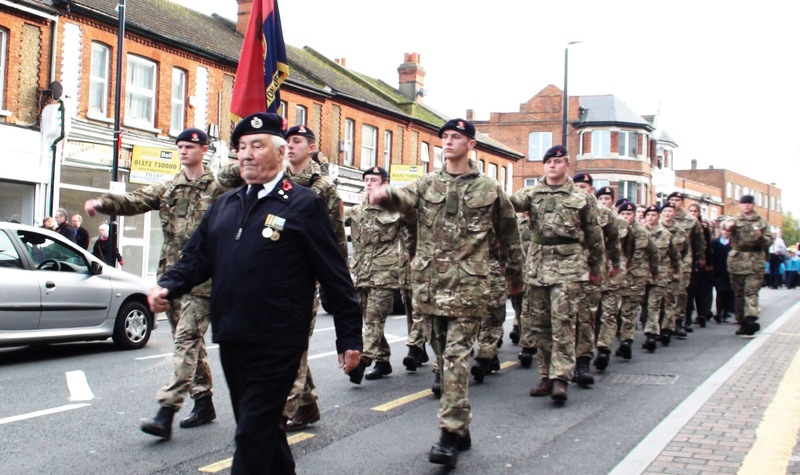 A few Fridays ago, readers may remember an extraordinary meeting taking place in Maple Lodge to discuss the outcomes of possible cuts to the police budget and the effects to policing in Worcester Park. Given that I am chair of the Worcester Park Residents' Association and as part of that role, also chair the local Police Safer Neighbourhood Team Ward Panel, I should really report on this here from that position rather than from the point of view of someone watching proceedings from an outside perspective. I would therefore invite comments from those who were present to augment what I have written here. Anyway, to give a little more background, back in early October, Michael Freter, chair of the Hamptons Estate Company (previously the Hamptons Residents' Association) asked me to call an extraordinary police ward panel meeting to discuss possible threats to local policing due to the difficult budgeting decisions being made at the moment. Given the concern over the issue I agreed this was appropriate and set about doing so. I wanted to invite our local MP Paul Scully and our London Assembly Member, Steve O'Connell (who might be termed as Boris's representative in Sutton and Croydon) to inform the meeting about what is happening at higher levels and so we could ask them to take our concerns to higher levels. 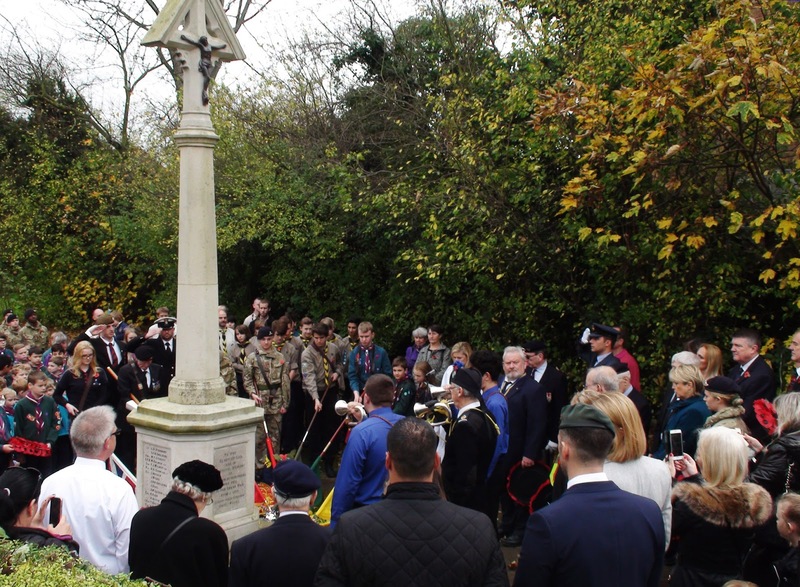 The only evening that both of them could attend the meeting was unfortunately a Friday evening (the 30th) which meant that two of our local councillors and both representatives from the Hamptons were unable to attend due to previous engagements. However Cllr Wingfield was able to be there to represent the councillors and Michael Freter had given me some points which I agreed to raise at the meeting on his behalf. 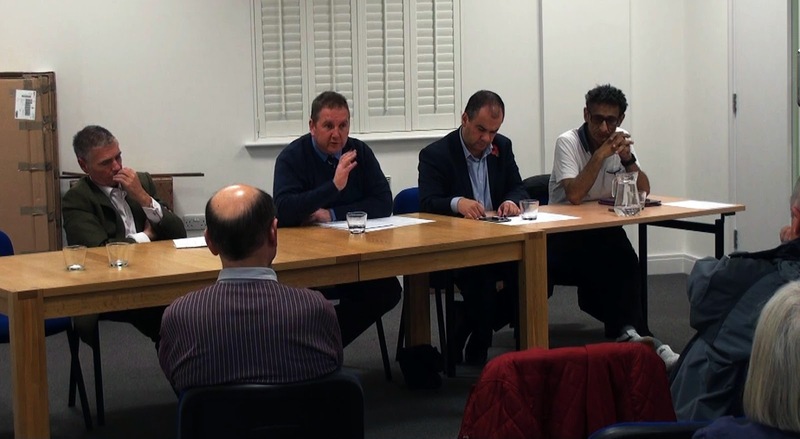 Being that the meeting was to discuss the budgeting and running of the metropolitan police, the local police felt it would not be right for them to be present, but they expressed their appreciation that we were trying to secure a better outcome for them. 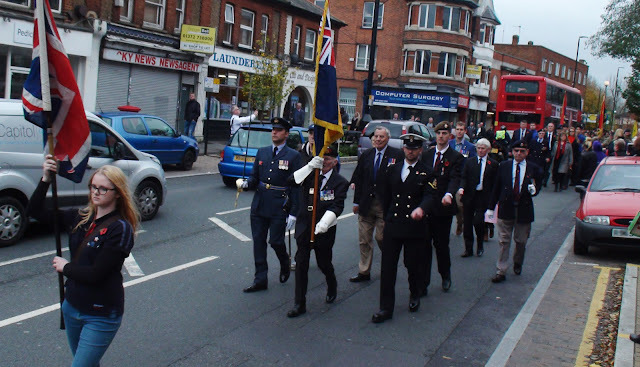 The picture above shows (from left to right) Steve O'Connell AM, myself, Paul Scully MP and Councillor Paul Wingfield. Around 20 - 25 local residents were present at the meeting to hear the information from both Paul and Steve and to discuss and debate the issue. For a single topic the meeting went on for almost two hours but being an extremely urgent issue, I felt it was important to let everyone speak who had something to say. One of the main outcomes of the meeting was a resolution that I should write to Sir Bernard Hogan-Howe, the Metropolitan Police Commissioner to express our views and position and to ask that the existing local police situation in Worcester Park remain unchanged. I have put a copy of most of that letter below, as it sets outs clearly much of what was discussed at the meeting without me needing to repeat myself. "Hopefully last Monday evening will have born fruit. I spent it asking the Chancellor to have another look at the police budget before considering anything that will have an effect on neighbourhood policing across London." Steve also promised to bring up the issue with Boris Johnson but added that Boris would not put up with the loss of local Safer Neighbourhood Policing in London. We all hope that with our efforts and the undoubted pressure being put on from many local communities, we will retain our valued Safer Neighbourhood Police in Worcester Park. What a relief! I'm sure we are all very pleased with the outcome of yesterdays budget spending review with the Chancellor protecting the police budget. Regular blog readers will remember a recent spate of Autumn events for children, run and organised by local event organiser, Richard Johnson. 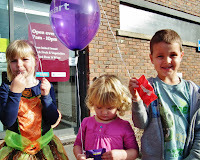 These included a drawing competition and a treasure hunt. 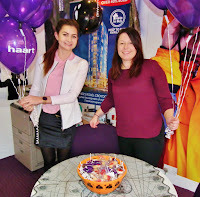 Both events were sponsored by the Sainsbury's Local at the top of Central Road with Haart (the estate agent) providing additional prizes for the treasure hunt. Well the winners of the Autumn design challenge have now been announced and as two of the three winners were members of 1st Worcester Park Girls Brigade, (who meet every Thursday, at nearby Christ Church with St Philip), it was organised to meet up there to give out the prizes. Congratulations go to Kalida Alnajjar (left), Ruth Ritchie (centre) and Lexi Hamilton-Warford (right), seen holding their winning designs on the left here. A big thank you also goes to shift manager Dan (seen at the rear), from Sainsbury's Local, who kindly came along to present the three prizes of a £10 book token. Alongside Dan is 1st WP Girls Brigade Captain, Angela. The organisers would like to thank everyone who took part and entered the competition. 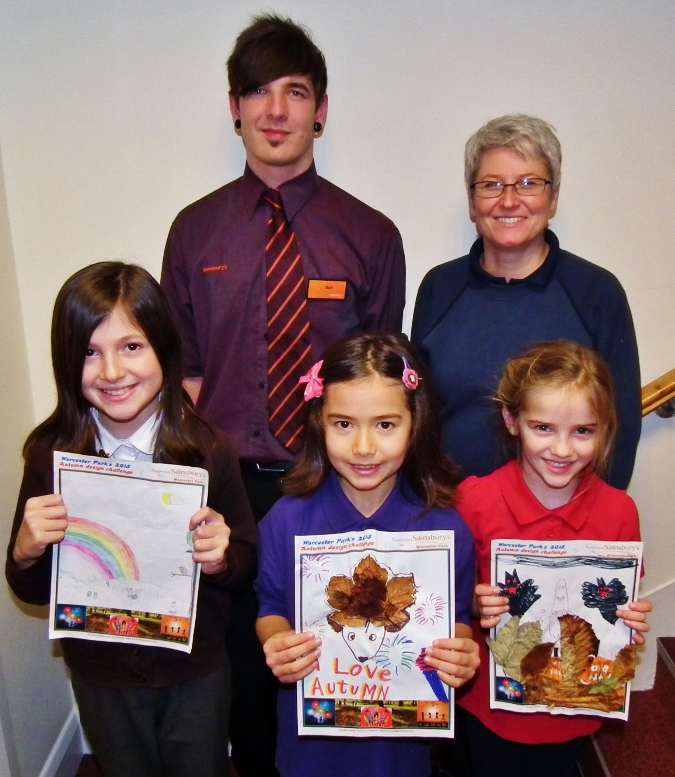 "The Sainsbury's team also showed me some of the entries and I saw there were a lot of thoughtful and creative ideas... Worcester Park has talent! For those that didn't win a prize this time, one or two local traders have expressed an interest in sponsoring future art competitions, so there undoubtedly will be more opportunities for local children to win a prize next year." 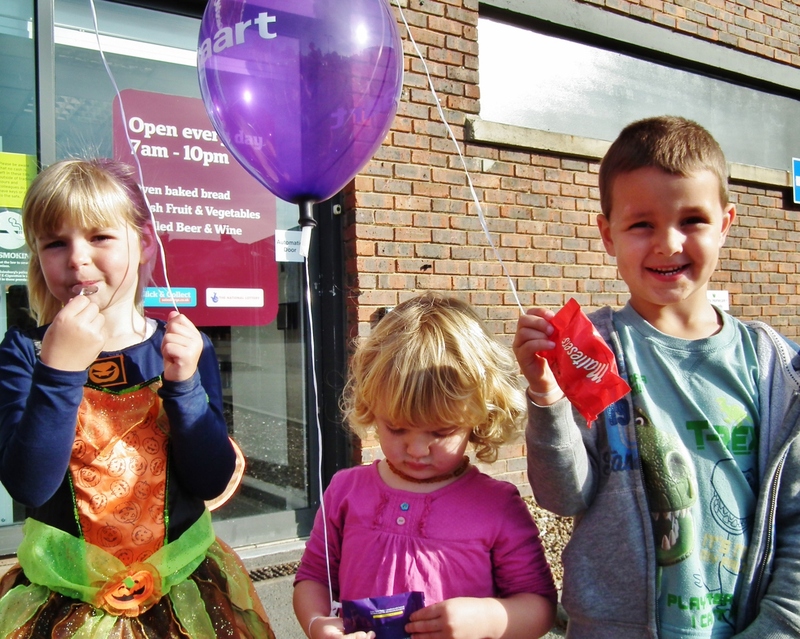 Then came the Autumn Treasure Hunt, where Worcester Park's children were invited to take part in a high street treasure hunt, where they were challenged to find 25 posters in the local shop windows on Hallowe'en evening. 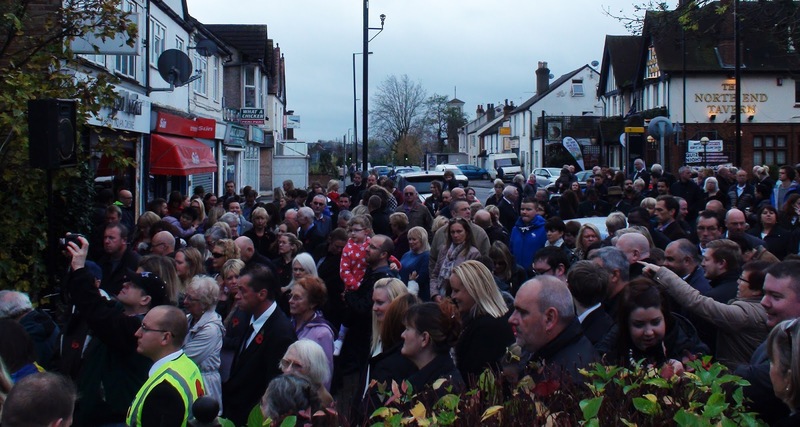 "I was amazed just how many shopkeepers were up for this, having grown from the initial 20 traders, who took part in the first treasure hunt, back in Easter 2014." 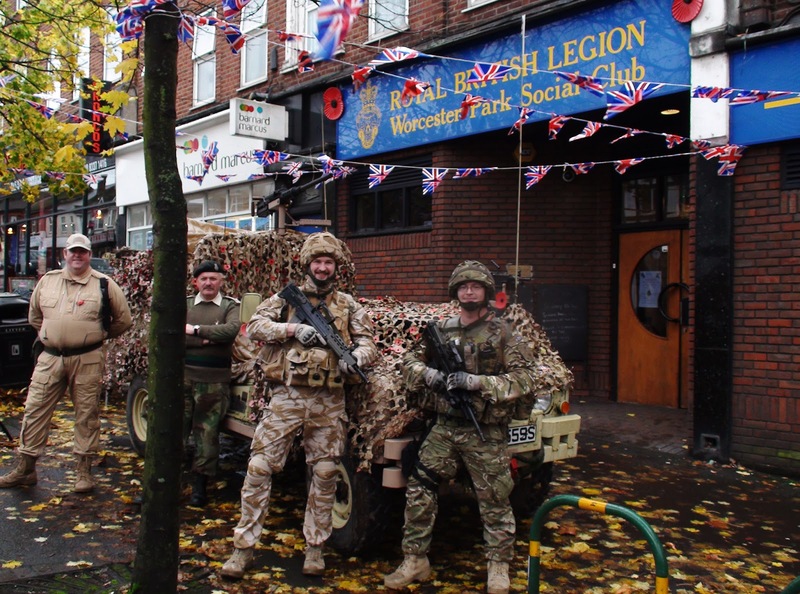 A big thank you to all of them for getting involved in local events like this and helping to keep the community spirit alive in Worcester Park. 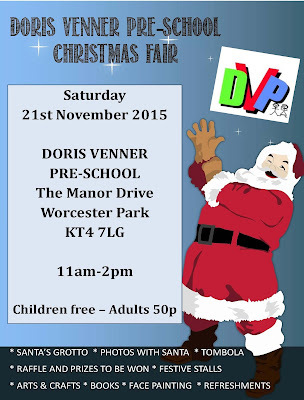 First out the blocks is Doris Venner Pre School (The Manor Drive, KT4 7LG) holding their event this coming Saturday 21st November from 11am 'til 2pm. 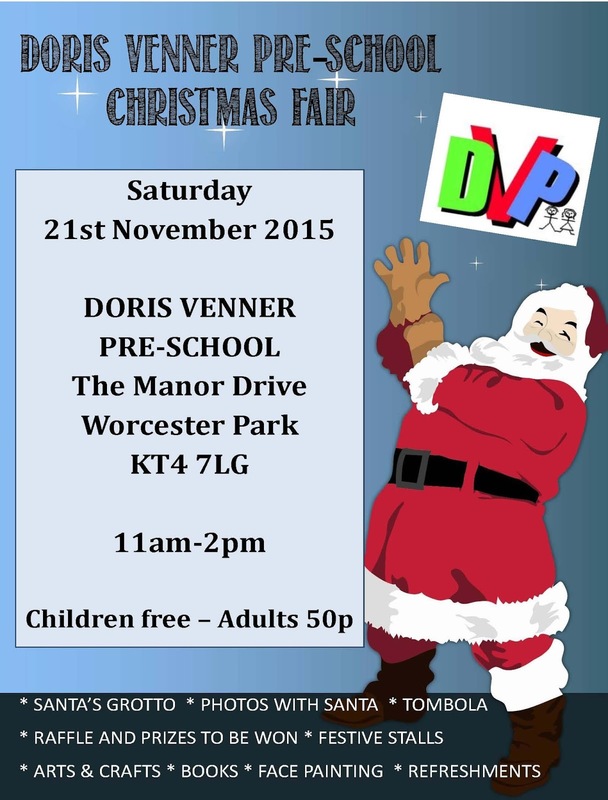 "Get in the festive spirit at the Doris Venner Pre-School Christmas Fair, a fun-filled event for all the family, with a host of activities going on from 11am – 2pm. Browse the festive stalls, try your luck on the tombola, enter the raffle and be in with a chance of winning some great prizes. Children will be able to meet Father Christmas and have their photo taken with him in his grotto." 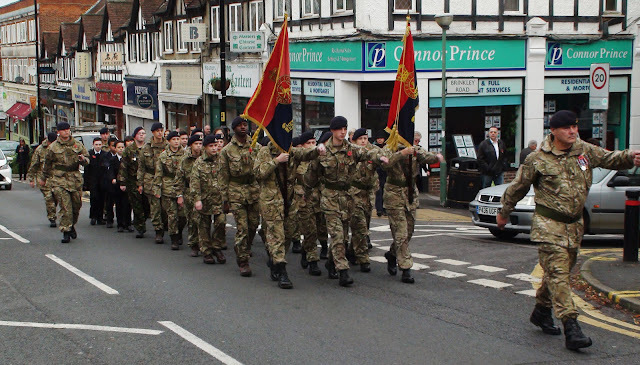 Entry will cost only 50p per adult and as DVP is a registered charity, funds raised will go directly to funding equipment for the pre-school. Nine years ago Mr Ink (AKA Patrick - although not Patrick Ink) opened up his retail shop at the bottom of the high street. Since that time many people have wondered how the shop has managed to stay open. Reports of people actually going into the shop were after all, few and far between. When Patrick took over the premises near the bottom of Central Road, the place was in a mess. Consequently he got a very good deal on the rental of the shop and set about fitting out the shop, doing all the work himself - as many independent retailers do, resulting in the ink boutique we have become familiar with over the last near decade. That lease ran for 9 years, and runs out in a couple of weeks time. 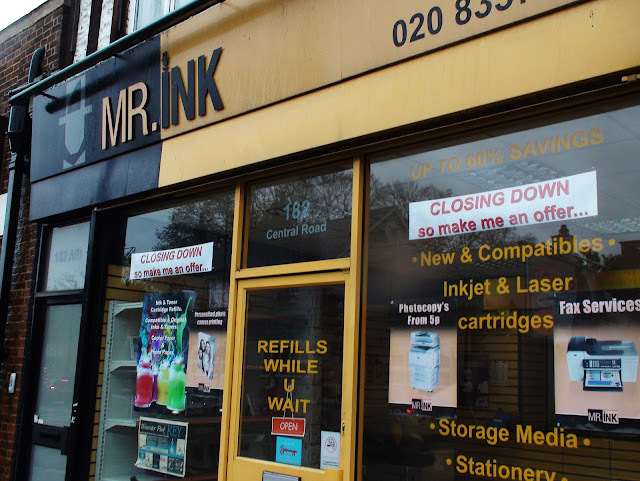 What most of us didn't know was that the vast majority of Mr Ink's business came not from people walking in off the street but through business to business work that remained largely unseen to the rest of us. Having the shop front may have raised his profile but having to always be ready to serve at the counter hasn't always meant he's been able to serve his other clients as well as he would like. And so Mr Ink is not, I repeat - not - going out of business. He is closing the shop front retail business in order to focus on his business to business work, which is where his real business has been the whole time. He will be able to do this, as so many businesses are these days, from an office at home not only lowing his overheads but also allowing him to serve his business clients even better, for instance by delivering directly to them. I think Worcester Park will miss Mr Ink once he has gone and the ever present ink emporium is no longer. I must admit that I had become a semi-regular customer in recent times - I do go through rather a lot of ink. We will certainly not welcome yet another empty shop in the high street. I hope the landlord will price the rent of the unit with a view to getting someone in quickly - but that's another story. 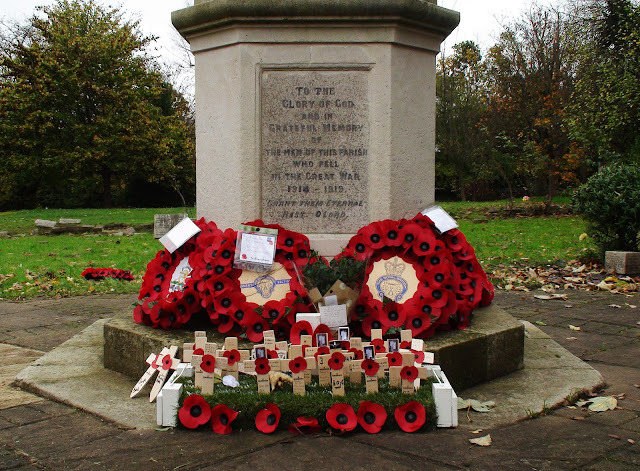 It's that time of year when we come together as a nation (or actually across the Commonwealth) to pay our respects and remember those who gave up everything so we could live in freedom and prosperity today. The Royal British Legion was pulling out all the stops today to encourage people to wear a poppy and remember our armed forces upon whose backs our way of life rests. These gentlemen were happy to pose for a few shots including one allowing WP Junior to pose with one of their guns (perhaps not one for this particular medium). 10:00am - Church Service at Christchurch With St Philip. 10:45am - Walk up to St. Philip's churchyard for the laying of wreaths and two minutes silence. 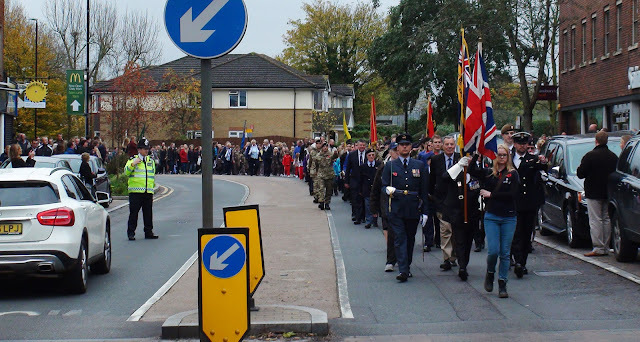 11:15am (approx) Parade down Central Road to the Royal British legion where everyone is welcome - and that includes non-members also. 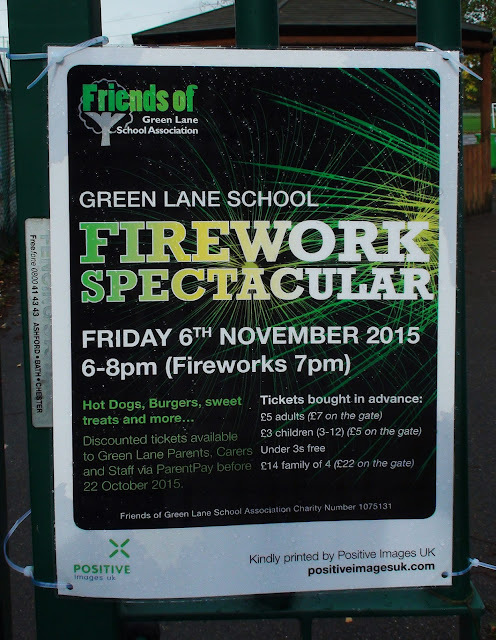 For those who crave a double helping of fireworks this weekend, you'd better get yourself down to Green Lane Primary School this evening (Friday 6th November). The entertainment starts at 6pm with the grand firework display at 7pm. There will be food and drink available as well. The cost to attend this event is (as shown in the poster here) £7 for adults and £5 for children (£22 for a family of four). Readers can of course complete their firework weekend experience at the Hamptons on Sunday for Free. But don't let that put you off this one. 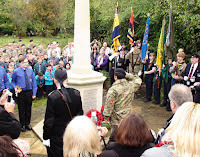 The money raised will be going to help augment the education of our young people so it is a very worthy cause. For those who are unsure, Green Lane Primary School is at the far end of Green Lane, there is very limited parking outside the school (please proceed with caution) so walking is recommended if you can.